Here I begin on my quest to discover the best produce delivery service in the Bay Area and Northern California. I assumed the task of choosing 10 different produce deliveries in the region, ordering one box per week, to find the most convenient, freshest, most nutrient dense produce in town. I will share my feedback about it - everything from placing the order, to delivery and unboxing, to examining and using the produce, and finally at the end I will rank them. I invite you to follow along! When I first arrived on the website I noticed the interface was easy on the eyes. The homepage showed a bountiful CSA, layered on top of a whimsical and dreamy photo of what I assumed was the Capay Organic farm. As I scrolled down the page, I read through the simple steps on how the process worked until coming to a link to get started. After I spent several minutes perusing the site, I figured it was time to get to work placing the order so I could continue on with my Farm Fresh To You review. Like so many in my generation, I absolutely love customizing things so I was very excited to dive in and begin the planning process. The homepage at Farm Fresh to You. First Step: Confirm my zip code. The Farm delivers to my area on Wednesdays. Noted, I will plan accordingly. Second Step: Time to build my box. 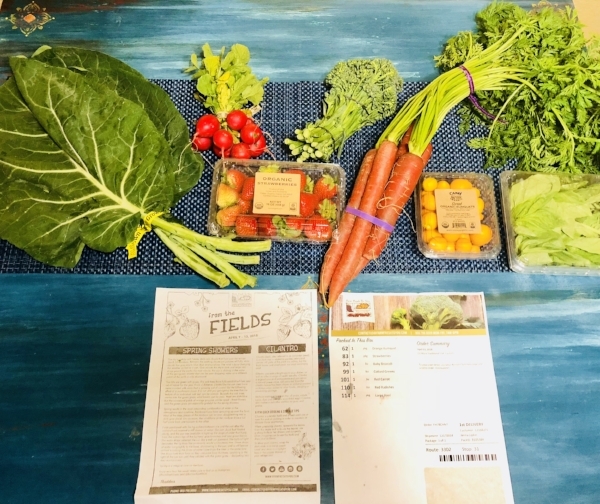 For this Farm Fresh To You review I opted for the Traditional CSA, which Farm Fresh To You claimed was the most seasonal box. There was an option to view sample box content that I found helpful. 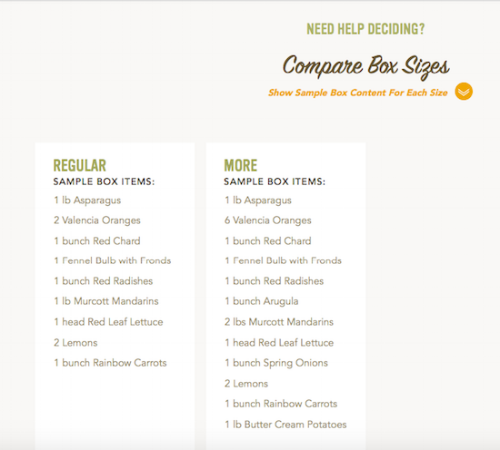 The sample Regular box listed 9 items and the sample More box listed 12 (screenshot on left). I believed I could take on the challenge of using all 12 items, so I selected More. Third Step: Confirm and pay. A couple of days after I placed my order I received an email that allowed me to further customize my box by swapping out produce items that were set to arrive. I opted to make a few substitutions based on some fruit and veggie cravings I had been experiencing as of recent. Next, I was given the option to include additional items from the farm such as dairy, eggs, or olive oil. For this Farm Fresh To You review, I did not include any add-ons. The Farm allows customers to create their own ‘never send’ list, which is basically like giving that vegetable or fruit a life sentence. The site also made it extremely easy to cancel service at any time, as long as cancellation took place no less than than two days prior to the next scheduled delivery. Delivery takes place between 8pm the night before and 8am that day. Farm Fresh To You explained that this helps maintain the freshness of the delivery, since California weather is cool both overnight and in the early morning. I thought this was a very interesting approach and I looked forward to testing the effectiveness of this method upon receiving my CSA. "To open, place hands here and squeeze." Like a child on Christmas morning, I awoke at 6am before the sun rose to check to see if my box was waiting for me outside, and it was! I could not wait to open it up and see what was inside. Printed on the top of the box were two handprints and the phrase “To open, place hands here and squeeze.“ The saying made me crack a smile. I squeezed the box with little physical effort and opened it with joy and excitement, no scissors required. I immediately noticed the vast array of colors inside. There were two pieces of paper: a product list and a timely fact sheet with a few articles, recipes and event listings. I noticed the temperature of the box was pleasant: the interior was not overly cold, but by no means was it warm. The overnight delivery method was a definite win for me. #success! I laid out each item of produce that I received, seven in total, which was much less than I had anticipated after I had read through the sample box list. I know I switched a few items around when given the chance to further customize my CSA, and I know a sample list should be used as a guide more or less, but seven vs 12 items is a pretty big difference in quantities for the price I paid. My CSA contents spread out on the table. Collard Greens: contained six large leaves, and when I say large I mean it. These green beauties were sturdy and vibrant. I immediately decided I was going to use them as a grain-free veggie wrap for lunch. Strawberries: I hadn’t bought strawberries in the longest time mostly because they are always very high up there on the dirty dozen list. The pint I received from Farm Fresh To You looked red and juicy, ready to bite in to, and free of chemicals. Red Carrots: I had eaten purple, yellow, white and of course orange, but never red. What also caught my eye were the girth of the carrots plus the plentiful greens pouring out the top of these beauties. Red Radishes: I had been searching for these at my local grocery stores for weeks now. Radishes have never been my favorite food per se but something about their unique taste and crunch makes them a great side veggie to consume every once in a while. Baby Broccoli: A cute little bundle of different shades of green - I really noticed the depth of darker hues with this bunch. Basil: This container included some of the largest leaves of basil I had ever seen. I immediately popped open the top and inhaled deeply - the aroma was intoxicating and made me immediately dream of a large dish of pasta! Kumquats: I opted to keep them as a wildcard choice in my CSA even though had no idea what they really were, what to do really with them, or if I’d even like them. After a quick examination, I washed the kumquats in a small colander, cleared a shelf in my refrigerator, and set everything up. Farm Fresh To You produce in my refrigerator. First thing’s first: I tasted a kumquat. I read on The Farm’s website that after a quick wash, you could pop the kumquat in your mouth and eat the entire thing. It looked like an orange, with the same sort of skin texture, just a lot smaller. I popped one in my mouth as directed, chewed it up a bit, seeds and all, and swallowed. The skin was not bitter like that of an orange. The seeds were pretty big but chewable. The juice was nice. For this Farm Fresh To You review, I experimented next with the red carrots in a side-by-side taste comparison with a store-bought orange carrot that was residing in my fridge. I crunched into the orange one, tasted it, and swallowed. Then I did the same for the red carrot. I had assumed that the red carrot straight from the farm would have a flavor profile that was much more robust than the ones purchased from the grocery store, but it was really exciting to experiment with these eye-catchingly large red carrots. As I wrote in my last post, if you have no idea what to do with your produce, you can Google a recipe or simply heat up some oil in a pan, chop your veggies, and sauté them with a little salt and pepper. That is exactly how I prepared both my radishes and baby broccoli this past week with some lemon juice squeezed on top. Both were delicious, took mere minutes of my day, and were great accompaniments to the next few meals I prepared. I made gluten-free veggie wraps for lunch this week. I added store bought hummus and made falafel balls from the Trader Joe’s falafel mix - definitely not the healthiest option (cornstarch), but healthy enough - convenience wins with this one. I layered fresh tomatoes, cucumbers, red carrots, and cilantro on top of my collard leaves, wrapped it up like a burrito, and dunked each bite into a homemade tahini sauce. The end result was satisfying and so very guilt free. This has become a tried and true comfort meal for me. I prepped it this week using a quinoa & brown rice spaghetti I had in the pantry from Trader Joe’s. The dairy-free creaminess comes from a mix of vegetable broth plus unsweetened almond milk. I threw in some frozen peas, roasted tomatoes, added some seasonings, and topped my dish with huge, fragrant, and fresh leaves of basil. Bellissimo! Roasted carrots are one of my favorite ways to eat the vegetable. They become so sweet when cooked at a high temperature. I cut these red ones up vertically and in to fourths (they were really thick carrots) and I drizzled a homemade vegan pesto sauce on top that I made from the green tops of the carrots. The green tops were so large and lovely I hated the idea of throwing them straight into the trashcan so I did what I could with them. The pesto sauce turned out great - it packed the spicy, sharp punch I was craving. Quick Tip: Later that week for dinner, I added a large dollop or two of left over pesto on top of vegan risotto I had kept in the fridge. Always keep your left overs close by - a little goes a long way, and you never know when you can combine a few things to create a quick meal. I discovered Natalie of Feasting on Fruit a few months ago. Natalie does a great job of letting fruit, maple syrups, and honey bear the load of sweetness for her dessert recipes. I enjoy something sweet at the end of a savory meal - it shifts the flavor profile. 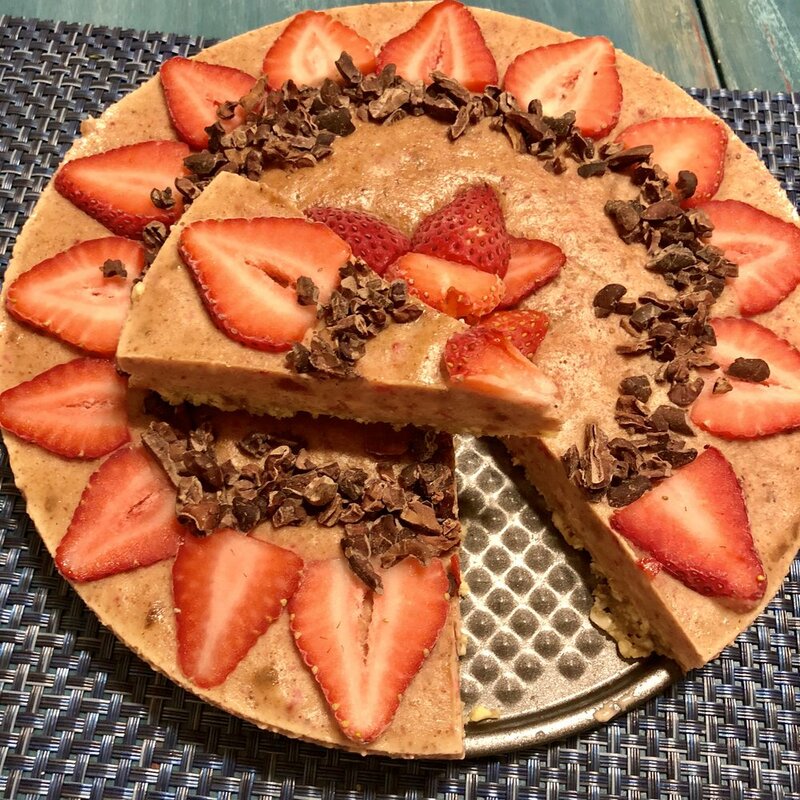 I usually bake up her Vegan Magic Bars, but due to the fact I had this beautiful pint of fresh strawberries showing off in the fridge, I opted for her No Bake Strawberry Cheesecake. I also kept a few fresh strawberries to the side for snacking. They were sweet, delicate, and satisfying on their own, delivering a burst of flavor once the skin had been pierced. All in all, I am pleased with Farm Fresh To You's CSA program. The ordering and delivery process went on without a hitch. All of my produce arrived fresh and delicious, though I thought I would have received a larger quantity based on my selection of the 'more' box at its $46 price point. I'd be curious to see how much produce is actually included in a regular box versus the sample boxes shown on the website. I know I will enjoy further comparing the value once I receive some of the other CSA boxes in weeks to come. I also wish that I switched out those kumquats. To this day I do not know quite how to use them, besides candying them with honey (perhaps not a terrible choice) or eating them raw. I know my mind and body greatly appreciated consuming this week's produce that was nutrient dense and straight from a local farm. Farm Fresh To You Ranking found here! This Farm Fresh To You review was so much fun and I learned a lot about the CSA process. I look forward to net week's box and to start comparing them all!